Written in context of the platform for exchange "How do we do it?" 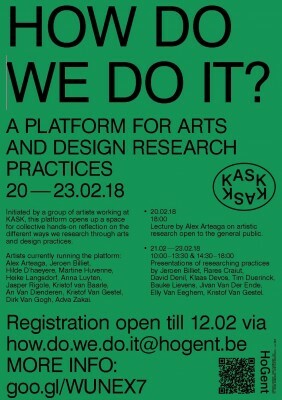 at KASK, Gent 20-23/02/2018. This last week I have made a small research trying to make clear to myself the difference between the doing and the sharing of my practice. It was a micro-process that was exemplary for how I research and for experiencing more clearly the different steps I go through during physical research. It confronted me, realizing that my embodied practice in the studio is only a small facet of how I do it. In other words, this last week I was dealing with insecurity about how to share my practice when I loosen it from its topics, their results and take them out of the safe environment that is the studio. I have decided to write/read out this text as an introduction to make you more familiar with some of the rhythms, the concepts, my irrationality and the way I relate to notions of creative exploration and intuition. I invite you to listen and after the short reading to take part in some of my research practices in order to explore what resonates with you or with your practice. Last years I have focused on artistic research that encircles my fascination for the cracks between my experience and my understanding of dancing and choreographing. My research practice - be it solo, in group and/or intermedial – is in the long run a search for releasing, in two directions, the binds between ‘choreography’ and ‘dance’ and the knots between ‘a dance’ and ‘its dancer’. Over the years my research has thus slowly transformed from an ontological towards a post-phenomenological one. In other words “what is dance/choreography” became “when and where is dance and choreography”. A transition from defining towards localizing and temporalizing. During the last five years my research practice extended. A somatic practice became a psychomotoric social exploration of movement and dance. This change in perspective came about when I noticed that I struggled to maintain my imaginative and creative freedom while I was hunting down a ‘centered’ instrument, a centered body-mind in research. A fear started to be present that this ever-growing somatic-based method - that I explored in collaboration with other dancers, biologists and physicians - was becoming too complex and therefor minimized my personal interests in an artistic exploration. Now I have come to understand that an overexposed awareness makes for a great technic and a splendid tool, but for as long as the research practice stays focused on understanding a science (i.e. physiology, embryology, biology) there is no necessity to move and thus no relation to dance let alone choreography. What is more, my body is never in balance, it is scattered out, it holds back and stutters, often it is self-destructive or obsessive and other time it shares intimacy. My answer was to create and test environments where the body is not in search for any ideal centeredness. My embodied research is now dealing more with what happens when I forget, when I don’t pay attention, how I deal with misunderstandings and how I can stop … and acknowledge that I’m already in practice. Already in daily or weekly practices, throughout the year, like visualization exercises, running, absent minded reading, automatic writing and practices in extending dreams (a practice of being half awake and softly guiding or exploring within a dream). These practices for the Self, or for myself, support the climate of my embodiment in research. A body climate that is almost always challenged by the intensified pressure (of time and space) experienced during research. I have to familiarize with this “research-sensation” every time again. It is of importance to me to accept these signals of stress as they are present when I practice. These daily routines and practices for myself are necessary in order to be hospitable to myself, to be at ease when welcoming strangers and welcome what is strange to me in the studio. Apart of the routines I also noticed that a big part of the research practice happens off-time. They are the walk to the studio, the small coffee break, a moment in the toilet or a cigarette. In these small breaks thoughts and ideas get propelled. Especially when researching alone I allow myself these moments of in-between practice. They are spaces of distraction, outside the expectations that can lurk in the process of an exploration. For me they are a major part of any research practice and something that I want to explore more in the future. Inside the studio, the environment is phenomenal, it is my background and thus orientates me in the practices. It takes part in how I sense and what I utilize, what becomes visible or invisible and where things are “in” and “out of place”. I have to be able to rely on it when the body disorientates in physics and/or in imagination. I try to avoid clock-time and prefer to sense temporality and duration in relation to what is being searched. To focus on the process instead of a goal-orientation so to more clearly distinguish what I desire from and what happens when experimenting. 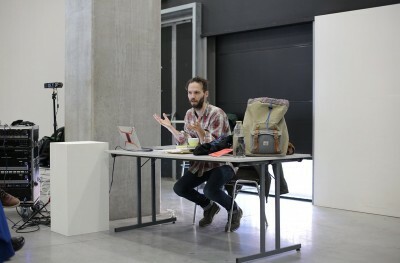 In order to process the experiences and to deal with the archiving of the process I rely on memory and on imagination. I try to find ways to implement the archive into the process. Often this happens by answering pre-defined questions in automatic writing, or in a group setting by continuously and simultaneously speaking in pairs without listening to each other. The practice almost always start with an extending of the awareness. They are somatic and psychosomatic visualizations. When I work by myself I pre-record the tracks and play them out while I am still, in a group-settings we take turns in guiding each other and continuously alter the exercise. These guided concentration exercises are a tool to experience what is already in play. The effect it has on embodiment helps to be more proximate to one’s instrument and thus experience the resonance or trace of a dance more clearly. What lacks after this practice is a precise dynamic, a recharging in order not to be too relax, too “stabile” or “centered’. A recharge that propels the person into the environment, in relation to what or who is outside of their body. Since approx. one year and a half I’ve been exploring the dynamic of flirtation as a performative recharging. What started out as an objective in research slowly turned into method. A rhetoric that is, just as the extended awareness, at the basis of how I practice research. I recognize it being a social creative dynamic when improvising in a group and in extension a rhetoric that situates the relation between the researcher and the research, theory and practice. To finish I list some of qualities and dynamics of flirtation.